What an absolutely exceptional period the last 12 months have been! This time last year we prepared to celebrate our Tercentenary year. 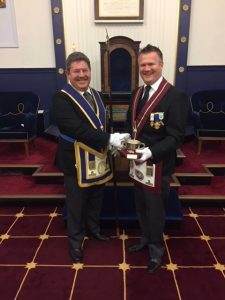 Over the last 12 months we have thoroughly enjoyed celebrations Nationally, Provincially and at a Lodge level to the extent that I am very happy that we, in Monmouthshire have used this unique opportunity to our best advantage; both enjoying the moment and also strengthening our future through the heightened promotion of our work within our local communities. 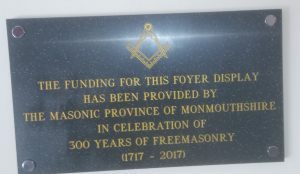 As our ‘mini-festival’ in favour of the Monmouthshire Masonic Trust Fund concludes, we will continue as a Province to enjoy a charity resource that enables us directly to benefit the communities in which we live, and for many years to come. The establishment of a building fund, a fund growing slowly but surely, will support the repair and improvement of our buildings in the future. There are very healthy signs that positive interest in Freemasonry has grown recently, leading to increased applications for membership. 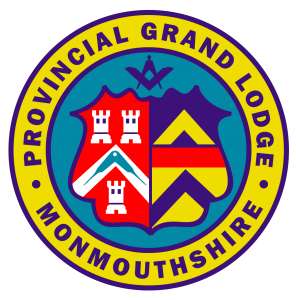 As members of the Province of Monmouthshire and as we move forward into the next 300 years, this is our golden opportunity to embrace this significant upward trend and to join with its momentum, for the benefit of our Membership and our Lodges. As ever we remain proud to be Monmouthshire Masons, so lets move forward with total determination to be stronger for the future generations of our members. 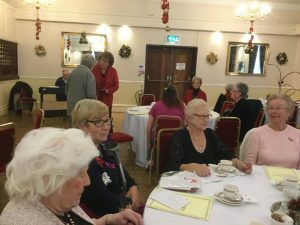 At Newport Masonic Hall earlier this week many of the widows and loved ones gathered for the annual ‘Carol’s and Mince Pies’. The morning was well attended and gave several the opportunity to meet old friends and acquaintances. Pictured are several of the Ladies and the Provincial Grand Master the RW Richard G. Davies circulating. The next gathering will be in the Spring when the Ladies enjoy a luncheon. At the Charles Lyne Installed Masters Lodge Installation meeting the PGM RW Bro. Richard G. Davies, gave an address regarding the Tercentenary year and the Province of Monmouthshire in general. 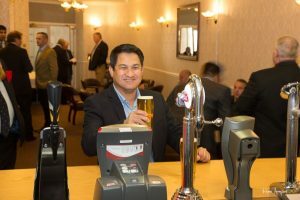 He mentioned the hugely successful charity donations which had culminated in the presentation evening at Newport Masonic Hall, where the grand total donated or awarded came to £120,900. A truly staggering sum of money which has gone to very worthwhile causes. He mentioned the 10 ‘Goose and Gridiron’ Dinners held around the Province and how pleased he was that many of those involved took part in the Lord Mayors parade in London. 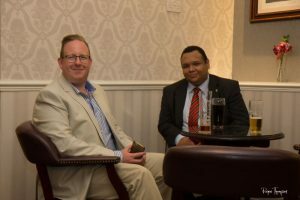 Also, the very successful Inter-Provincial Dinner held with our close friends and neighbours in the Province of Bristol. 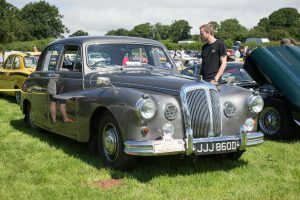 These events, along with the other major events that Monmouthshire had either organised or had been part of made him feel truly satisfied the Province had celebrated our Tercentenary year with style and great enjoyment and no doubt would move forward into 2018 all the stronger for what we had achieved in the past year. Looking forward to 2018, he mentioned the setting up of the Provincial Building Fund with its potential to assist Lodge buildings in case of emergency or development in the future. The fund is growing quietly but surely. 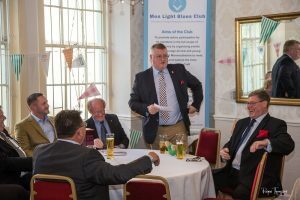 The formation of the Light Blues Club for new and young Masons was now established. The introduction of the TLC scheme at the Royal Gwent Hospital, where distressed children are given a Teddy to comfort them in A & E and that the Light Blues Club were currently fund raising for that appeal. He was very pleased that the publicity we had enjoyed from the South Wales Argus had been frequent and constructive and that Freemasonry at present appeared to be riding on ‘A crest of a wave’ generally and Monmouthshire were striving to continue that both regarding membership and closer links with the community. 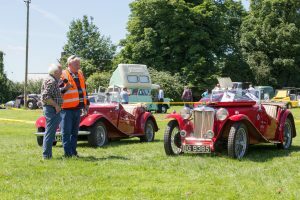 He closed by mentioning the ‘Mini Festival’ in aid of the depleted capital funds within the Monmouthshire Masonic Trust Fund. This will be concluded on the 31st December and it was hoped that the final figure would be in excess of £325,000. He thanked all those who had been involved in raising such a magnificent sum, particularly the Provincial Grand Charity Steward, the Charity Committee, the Lodge Charity Stewards and all those who gave so generously. The Provincial Grand Master would also like to take this opportunity of wishing you and your loved ones a happy Christmas and a healthy and prosperous New Year. 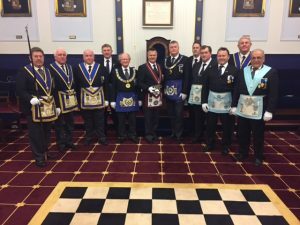 A highly colourful Malta meeting was held in the Province of Monmouth and South Wales in November when seven candidates were admitted to the Ancient and Masonic Order of St John of Jerusalem, Palestine, Rhodes and Malta. 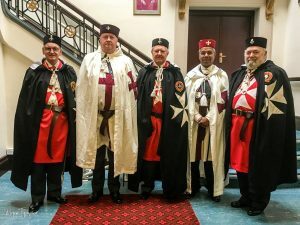 This annual Provincial Malta Meeting cut quite a sight with Bro Knights robed in the red, white and black regalia of the Malta Degree together with Knights in the red and white Templar regalia also. 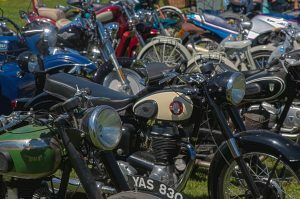 The meeting this year attracted a particularly large number of brethren from right across the south of Wales from Chepstow to Milford Haven. Presided over by the Provincial Prior for Monmouth and South Wales, RE Kt Dr Paul Richard Calderwood, the ceremonial was largely conducted by the Provincial Sub-Prior, E Kt David Francis Court â€“ and in an exemplary manner. The photo shows (left to right) E Kt Paul Calderwood, Kt Christopher Evans, E Kt David Court, Kt Louis Mahendra and E Kt Stephen Hookey. Earlier this week W. Bro. Vince White and W. Bro. Vernon Edwards attended a Celebration of Lifelites upgrades to the special equipment installed by them at Ty Hafan in Sully. The Provincial Almoner and his wife Val attended representing the Province along with W. Bro. Vernon Edwards and his good lady Elaine. Pictured left to right are: Carol Killa, Director of Care Services, Ty Hafan; Katherine Bentley, LifelitesTrainer; Simone Enefer Doy, C.E.O. Lifelites ; W.Bro. Vince White, Provincial Grand Almoner. In the centre of the picture is the latest ‘Eyegaze’ equipment which allows the user to control the computer cursor by simply looking at the screen. Special sensors on the equipment detect where the eye is looking and moves the cursor accordingly. The CEO of Lifelites and the staff at Ty Hafan thanked the Freemasons of Monmouthshire for their most generous support. 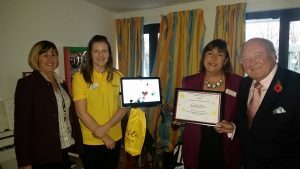 The Sparkle Appeal were very pleased to invite me to the Serennu centre to show off their fantastic facilities for the young with disabilities. It was good to meet such dedicated people, well deserving of the £25,000 from the Masonic Charitable Foundation. 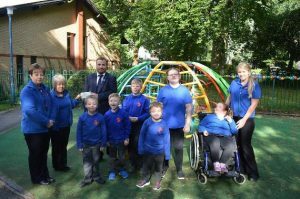 The pupils at Overmonnow Primary Schools Special Needs Resource Base (SNRB) will have a new iPad thanks to a donation from the Monmouth Masonic Lodge. On Sunday, 3rd September the lodge raised £245 from a fundraising event which they donated to the SNRB. 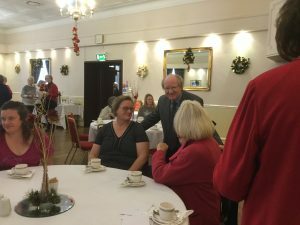 Worshipful Master Gabriel Hilu said: We held a cream tea and trains afternoon as a fundraiser, one of the members has a large train set which he opened up and we invited people to come along. The iPad will be a helpful addition to the SNRB classroom according to treasurer of meeting the needs, Deb Beech. The touch screen allows the pupils to learn in ways which they cant with books, pen and paper and even regular computers. She said: We are very grateful of the continued support of the Masonic Lodge, we will be putting their generous donation towards a new iPad and adding to and updating our IT resources. With acknowledgement to the Monmouthshire Beacon for this article. W. Bro. Kelvin Reddicliffe does it again! Above is a picture of the Casnewydd Lodge member, W. Bro. Kelvin Reddicliffe (aka serial fundraiser). The picture shows him presenting a cheque for the magnificent sum of £1725 to the Dreams & Wishes charity which the Lodge support. He has raised the money from the sale of Chartist Mural limited editions and other memorabilia sold through various fundraising events in and around Newport. This photograph appeared in the South Wales Argus. Its W. Bro. 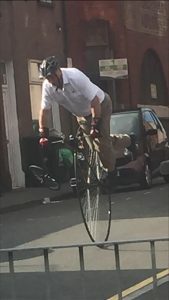 Roger Thompson on his way to work through the busy town!! 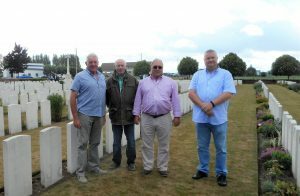 John Mayo (second from right) of Vassar-Smith Lodge has just returned from Belgium where he attended the Passchendaele centenary commemorations. In a small cemetery near Ypres, he and his sister Margaret laid a wreath on the grave of their Great-uncle Jim. He was also the uncle of Jim (Vale of Castiard Lodge) and Phil Blatchly (also Vassar-Smith), said John. Commenting on the photo, John said, Sadly, the lens appears to have distorted some of us around the waistline! The cemetery was also the last resting place of the poet Hedd Wyn and BBC2 was present, filming for a programme to be broadcast this Saturday. HRH The Prince of Wales visited this grave the following day after the commemoration at Tyne Cot. This article, written by W. Bro. John Mayo of the Province of Gloucestershire forwarded courtesy of W. Bro. Bob Jones. What a fantastic show!! 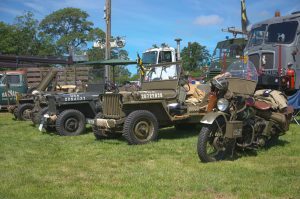 Over 200 exhibitors at the 3rd Annual Classic Vehicle show in Monmouthshire. 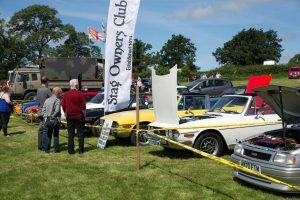 We had it all, wonderful cars, wonderful weather and many visitors to view them. 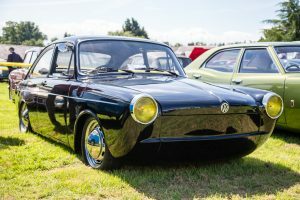 Exhibitors were free and it was only £5 per car to come and view them. All for local charities and good causes. We finished the day off with an evening event which included a Queen tribute band, the figures aren’t finalised yet but it is likely to be many thousands of pounds. Many thanks to all who participated and we look forward to seeing you next year. Not forgetting also, many thanks to all those who gave their time helping to organise such a wonderful day and evening. Its nice to have a little recognition. Here’s a plaque that can be found in the foyer of the Congress Theatre Cwmbran. Light Blues club is up and running! A few pictures from the launch of the Monmouthshire Light Blues Club. 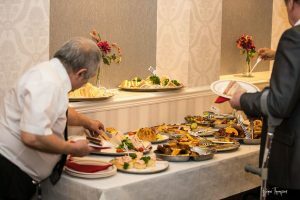 The aim of the group is to promote active participation by its members in the full scope of Freemasonry by organising events which encourage all new and young Freemasons of Monmouthshire to meet, socialise and explore the inner meaning of the Craft. 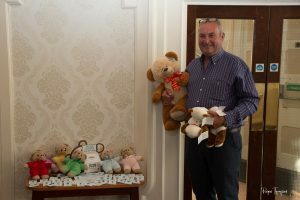 Fundraising for the TLC hospital teddies is also high on their list and we wish them well with their endeavours. 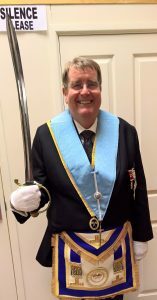 A ‘new’ sword for the blue lamp lodge. At the Installation of Blue Lamp Lodge on 25.5.17, the W.M. WBro. Ken Baker was unable to attend owing to ill health which resulted in the Lodge Secretary, WBro. R.M. Jones taking the Chair to install the Master Elect, WBro. D.W. Llewellyn. Bro. Andy Goodall of the Beaufort Lodge, Swansea attended the meeting. Bro. 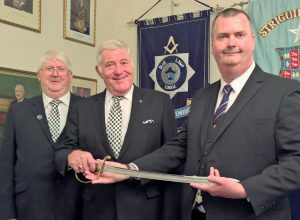 Goodall, a South Wales Police Dog Handler presented to the Lodge a Mounted Police Officers sabre of the former Oxford City Police to be used as a Tylers sword. 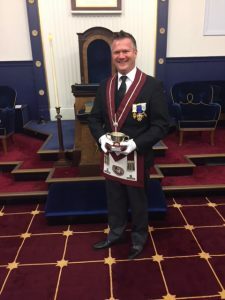 Bro Goodall is to become a joining member of Blue Lamp Lodge. Attached are photographs of WBro. Brian Bevan, Lodge Tyler with the sword, two pictures of the sword and a picture of WBro. D.W. Llewellyn, WBro. R.M. Jones and Bro. A. Goodall with the sword. Have you ever wondered what Masons do when we attend our Lodges? We form a queue and parade into the Temple; you may well think we are all mental!! The Worshipful Master is standing there and opens the Lodge with a humble prayer. A ritual to perform is usually the norm, the lights go dim, a candidate is lead in, he is told a story, which some may say is a little gory. About an ancient Brother called Hiram Abiff; who some say is a myth, but we know him as the widows son. After the ceremony and the work is done the Master rises from the chair and we close the Lodge with solemn prayer. Why not come and join us there? Happy to meet, sorry to part and happy to meet again. W Bro. 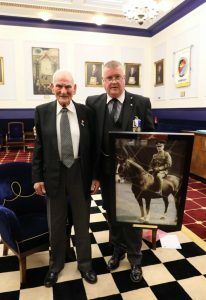 George H. Reynolds receiving a portrait of himself by the DPGM taken from an image whilst W Bro. George was serving in His Majesty’s Forces. At almost 100 years old W Bro. George is one of Monmouthshire’s true characters who enrich our Fraternity. 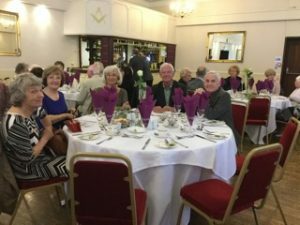 The Widows Spring Lunch was held at Newport Masonic Hall and was a great success. 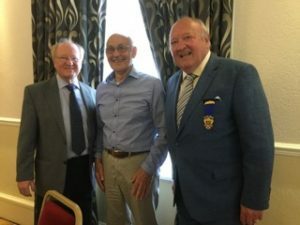 The event was hosted by the Provincial Grand Master and the guest speaker was Mr.Clive Hard, a retired physiotherapist who gave an informative and interesting talk on the benefits of gentle exercise which everyone found interesting and hopefully will benefit from. After the talk a lunch was served and the day continued with convivial conversation by all. £165 was raised for the Osteoporosis Charity and this was presented to Mr. Clive Hard. 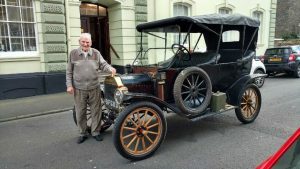 This article courtesy of W. Bro. Vince White. What a fine example of a Mason, W. Bro. John Judd of the St John’s Lodge has been honoured by Grand Lodge. He has been invested as an active Assistant Grand Director of Ceremonies. Without doubt, an honour well deserved. 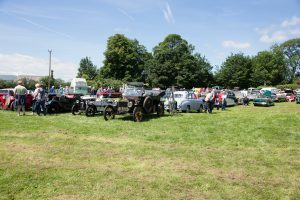 Classic Vehicle Show and Summer Extravaganza poster. Click on the link for all the details. 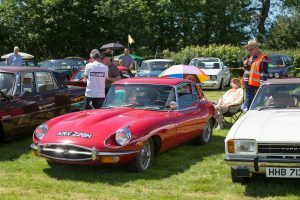 Monmouthshire will be supporting this event along with three other Provinces, with hopefully 100 Classic vehicles on display. Click the hyperlink for full details. Copy and paste the link below in to your browser for a two minute film showing some of the highlights of the unveiling ceremony of the 63 stones laid in memory of the Freemasons who won the Victoria Cross. The Monmouthshire demonstration team who re enacted the first meeting held 300 yrs ago at the Goose & Gridiron. What a wonderful evening celebrating the origins of United Grand Lodge. The demonstration team will be performing around the Province over the next two months. Which came first? both from the great war. W. Bro. 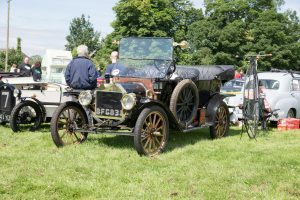 George H. Reynolds (July 1918) and Model T Ford (August 1914) both of which came into being during the Great War and likely to be at the Monmouthshire Masonic Classic Vehicle show on the 1st of July at the Hogs Head Llantisilio Crosseny. 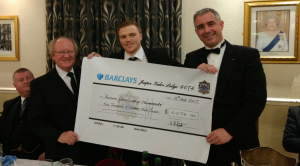 jasper tudor lodge maintain their reputation as charity champions! What a wonderful sum of money. The Jasper Tudor Lodge No. 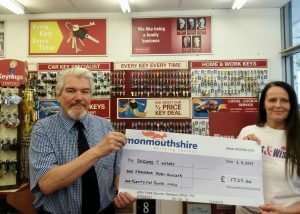 4074, donated £4074 to the Monmouthshire 1997 trust fund which is dedicated to supporting local charities. Added to that was £425.30 raised in a raffle on the occasion of the Lodge Installation evening and a mysterious donation of 70 pence to make the total given a magnificent £4500. 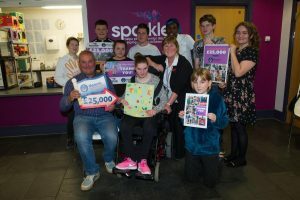 The funds were raised throughout the year by many different events. From raffles at Lodge meetings, guessing the weight of a pumpkin at the Provincial Grand Lodge meeting, a race night in May and a social evening in October, and a lottery bonus ball scheme but without doubt, the highest fundraiser was the event held in the Summer by the Maindee Martial Arts and Fitness Centre who raised many thousands of pounds towards helping young people achieve things that without the financial support of those around them they would never be able to do. As several Brethren are members of that group they were more than pleased to help the trust fund as well as their other good causes. 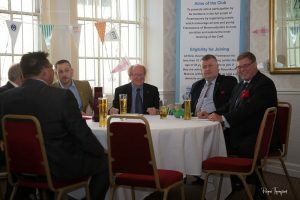 Deputy PGM Chris Evans (background) RWPGM Richard G Davies, Brother Aaron Gassor and W.Bro. Ben Waters. Congratulations to the Lodge in general and all those who were instrumental in raising such a large sum of money to help those less fortunate than ourselves. 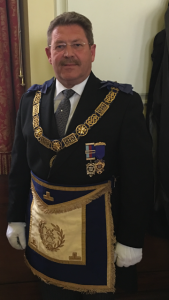 On Friday 10th February, Bro Andrew Price (The Armed Forces Lodge Charity Steward) was Installed into the Chair of Comrades Lodge 2740 (his mother lodge) at Freemasons Hall, Great Queen Street, London. 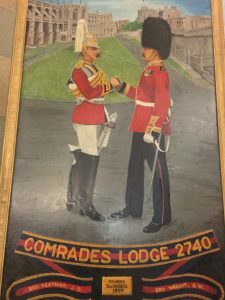 Comrades Lodge is a Lodge for serving or retired Warrant Officers and Senior ranks of the Guards Division. 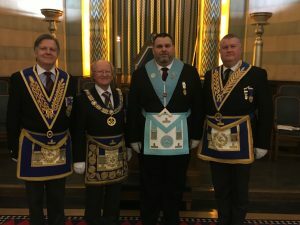 There was massive support from Monmouthshire Masons, with over twenty making the trip to London, including The Right Worshipful Provincial Grand Master and Deputy Provincial Grand Master. Temple number 10 (the second largest temple in the building, which houses 23 temples), provided the stunning backdrop to a military style ceremony of West End workings. The festive board was certainly one to remember with some fantastic speeches along with music accompaniment from three Scots Guards Pipers! WBro Andy Price with his brother Steve, The Worshipful Master of Kennard Lodge 1258. WBro Andy Price with Rt WBro Richard Davies The Right Worshipful Provincial Grand Master of Monmouthshire, WBro Chris Evans The Deputy Provincial Grand Master of Monmouthshire and WBro (Colonel) Bill Withers The Assistant Provincial Grand Master, Hampshire and the Isle of Wight. 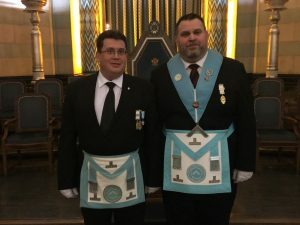 This article courtesy of W Bro. Steve Price. 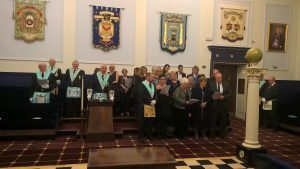 The Masonic Festival: Monmouthshire Provincial Grand Lodge Meeting. Newport witnessed a very interesting spectacle on Wednesday, on the occasion of the provincial gathering of the brethren of this mystic bond.” Flags, emblazoned with Masonic emblems, with the banners of England and other nations, spanned High-street, from the Freemasons Hall, to the opposite house, and were also extended across the commencement of Stow-hill. Indeed, the principal parts of the town generally wore a gala appearance and the vessels in the port hoisted their colours, whilst the mellow-toned bells of St. Woollos rang out enlivening peals in honour of the occasion. The Freemasons Hall, High Street, where the Silurian Lodge met, was very tastefully decorated for the occasion, under the direction of Brother David Blackwood. Above the chair we observed an elegantly formed evergreen crown, into which were weaved, very tastefully, the early flowers of the season. The vice chair was surmounted by a chastely formed plume of feathers, with the Prince of Wales’s motto – “Ich Dien” or “I serve” and a scroll immediately underneath, with the words – “Audi, vide, tact,” or “Hear, see, and be silent.” Tasteful wreaths were also suspended over the various chairs, and around the room, the whole producing a beautiful and harmonious effect. The Brethren were indebted to Brother Thomas Powell, Esq., The Gaer, Brother Lyne, Brother Nicholas, and O. Morgan, Esq. M.P. for the lavish supply of flowers and evergreens, with which the lodge-room was decorated. (The article continues, but this extract gives us a clear picture of 19th century Provincial activities). As we step into 2017 , we prepare to celebrate our Tercentenary , ( the first 300 years of Leadership by a Grand Master ) and we also prepare to move into the next 300 years . We have much to look forward to this year and I sincerely trust that every Member of the Province will be able to take part in at least one of the celebratory events ; many of you hopefully several . In fact , I fully anticipate that the first 6 months of the year will be dominated by celebration and events supporting our historic and prestigious past . Whilst we do this , the Grand Principles upon which our Order is founded – ” Brotherly love relief and truth ” – remain as relevant today as they did 300 years ago . In more modern language they may be stated to be ” integrity , honesty , fairness , kindness and tolerance ” , but whatever the wording , the message within it provides the perfect and continuing foundation for our future. 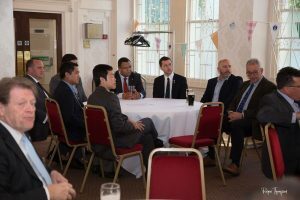 In due time , through the course of the year , we must begin to address more serious issues , most notably Membership and Buildings , but in the short term why don’t we just concentrate on enjoying ourselves – ” enjoying the moment ” – in the celebration of 300 years of Freemasonry as we know it today . We are fully entitled to do that for all that we and those who have gone before us have achieved : both for ourselves , our local communities and for the world at large . Finally , let us all be proud to remember that we are ” Monmouthshire Masons ” and , as such , proud to be part of a very close knit family and community . I wish you all a very happy and healthy New Year. 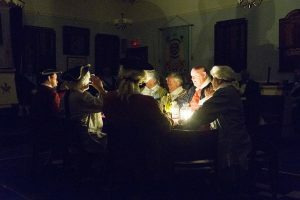 Throughout the Province many Lodges enjoyed festive meetings. Below are two such Lodges, Isca and the Lodge of Friendship. 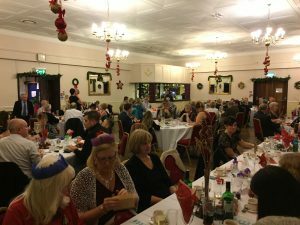 The Isca Lodge were fortunate to have 85 attend the event and they raised the magnificent sum of almost £500 for local charities. Perhaps next year we can have even more photos as I know of at least five other lodges who held such events.